Skin cancer often involves the skin of the eyelid (most commonly the lower eyelid) or adjacent face; however, it might possibly be found anywhere on the eyelid margins, corners of the eye, eyebrow skin, or adjacent areas of the face. Usually, they appear as painless elevations or nodules. Occasionally, the eyelashes are distorted or missing. There might possibly be ulcerations of the involved area, along with bleeding, crusting, and/or distortion of the normal skin structure. Such findings need to be evaluated and might possibly require a biopsy to confirm the diagnosis of skin cancer. Skin cancer might possibly appear as painless elevations or nodules. Occasionally, the eyelashes are distorted or missing. There might possibly be ulcerations of the involved area, along with bleeding, crusting, and/or distortion of the normal skin structure. Excessive exposure to sunlight is the single most important factor associated with skin cancers on the face, eyelids, and arms. Human skin is particularly affected by the sun's UV-B radiation. Exposure to UV-B results in reddening of skin and sunburn. Fair-skinned individuals develop skin cancers more often than dark-skinned. Protection via suntan lotion with a high SPF is critical. Physicians associate eye cataracts with UV exposure. Be sure that you wear sunglasses or contact lenses with appropriate protection. The most common types of skin cancers are basal cell carcinoma and squamous cell carcinoma. Both types enlarge locally and usually do not spread (metastasize) to distant parts of the body. But, if it is not completely excised, it will eventually invade adjacent structures. Since both basal and squamous cell carcinoma are relatively slow growing, if they are detected early and treated in a prompt and appropriate manner, there is an excellent chance of removing the tumor completely and minimizing the amount of tissue affected by the carcinoma. Sebaceous gland carcinoma and malignant melanoma are more serious forms of skin cancer because they might possibly spread (metastasize) to other parts of the body. These types of skin cancer require prompt, aggressive treatment because of the threat of early spread. 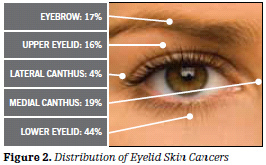 There are two very important principles in the management of eyelid skin cancers--complete removal and reconstruction. Complete removal of the tumor is critical to minimize the possibility of recurrence, which is even more difficult to manage. The surgeon might possibly remove the tumor and have a pathologist check the tissue margins ("frozen section") to be sure the tumor is completely removed. Alternatively, a dermatologic surgeon might possibly excise the tumor in a special way ("Mohs technique") to ensure total removal. Needless to say, the goal is to reconstruct the eyelid so that it functions well, protects the eye, preserves vision, and has a satisfactory cosmetic appearance. The patient must keep in mind that any form of therapy for eyelid skin cancer will leave a scar. However, an effort is always made to minimize scarring and obtain optimal cosmetic results. After surgery, the healing process might possibly take six months to one year. Once the wound has healed, follow-up with your physician is necessary to be sure that the skin cancer does not recur. Should there be development of a new cancer, it can then be detected early and treated promptly. UV Exposure: The intensity of UV radiation reaching the Earths surface is not uniform in UV wavelength components. Due to ozone absorption, UV rays with wavelengths shorter than 290nm (often classified as the UV-C range) are of negligible intensity. SPF: Sun Protection Factor describes the increased allowable time of sun exposure before your particular skin type burns. For example, SPF4 means you are might possibly exposure yourself to the sun four times longer without burning.